Turmeric is the spice that gives curry its yellow colour, and has powerful anti-inflammatory and antioxidant properties. 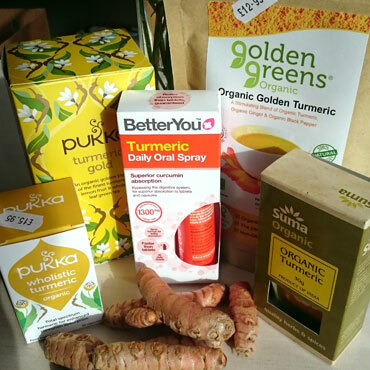 We stock fresh turmeric, plus capsules of wholistic turmeric. We also offer a turmeric oral spray  which makes it easier for the body to absorb its active ingredients (curcuminoids). The benefits of taking apple cider vinegar, especially with 'the Mother'*, have long been widely known. Containing potassium and enzymes, cider vinegar is reputed to be helpful in a wide range of health issues  including stomach and digestive troubles, colds and sore throats, high cholesterol, leg cramps, bad breath, assisting weight loss... even getting rid of dandruff! But most importantly it has been shown to help balance blood sugar levels and reduce the likelihood of diabetes. It's best to take a couple of tablespoons daily, diluted with water and sweetened with honey if preferred. TIP: A lovely refreshing summer drink is to mix a couple of spoonfuls of apple cider vinegar with sparkling water and slices of ginger and lemon. Surprisingly delicious! 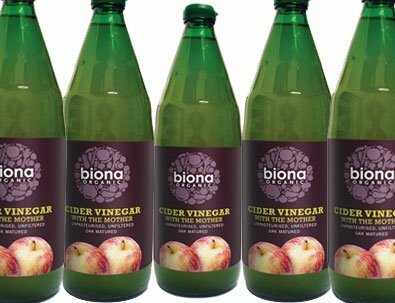 Haworth Wholefoods stocks the excellent Biona Organic Apple Cider Vinegar with 'the Mother'* at £2.89. Refills are available for £2.45. * This is apple cider vinegar that has not been heat-treated and still has the culture of beneficial bacteria that turns regular apple cider into vinegar in the first place. Seaweed is a superfood full of nutrients that packs a variety of health benefits. It is high in iodine, magnesium, calcium, omega 3, vitamins B12, A and C, and almost as rich in protein as legumes. 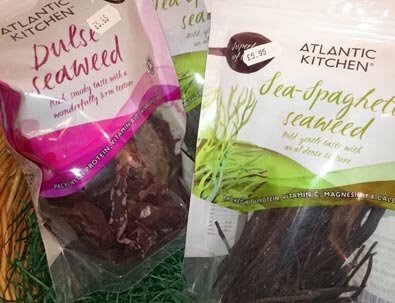 Atlantic Kitchen Seaweed is dried and ready for adding to your favourite dishes. Kefir, kephir or búlgaros is a fermented milk drink made with kefir 'grains'. You may have seen it recommended on TV's 'Trust Me, I'm a Doctor' as the clear winner of a trial to find the product that increased the population of beneficial gut bacteria the most in a group of volunteers. With each year it becomes clearer that having a healthy and diverse 'micro biome' in your digestive tract is essential for good overall health  providing resistance to disease, including cancer, and good uptake of nutrients in food. It also makes the development of allergies and intolerances less likely. 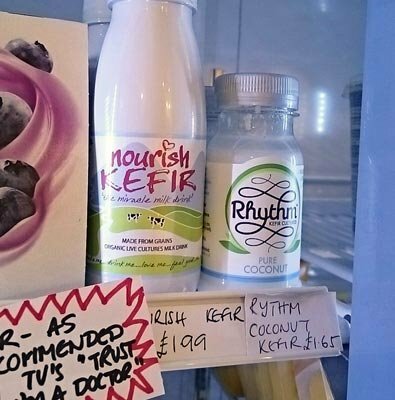 We stock Nourish Kefir and Rhythm Kefir, in dairy and coconut milk varieties  which are available in the fridge. We also stock sauerkraut, kimchi and kombucha, which have similar qualities. Spring water from the New Forest in bottles made entirely from plants not plastic! Bottles are 100% compostable in a hot compost heap  they can be put into food and garden waste council collections and will biodegrade in about six months. Millions of plastic bottles end up in landfill in the UK every year, and each one can take up to 1000 years to decompose. This is just not sustainable. 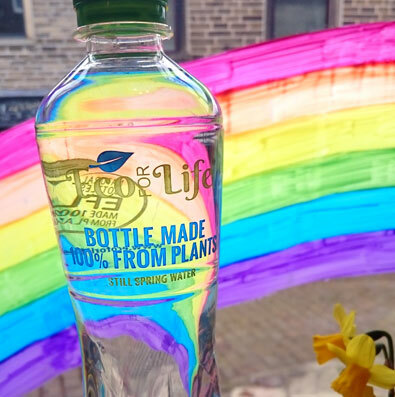 Eco for Life bottles are made from corn starch not oil, so they decompose relatively quickly and do not leach unpleasant chemicals into the water inside. They can also be reused, refilled or recycled into another bottle. As part of the Refill campaign, we are very happy to refill any bottles with tap water in the shop free of charge.